Well it is finally finished and on the bed! 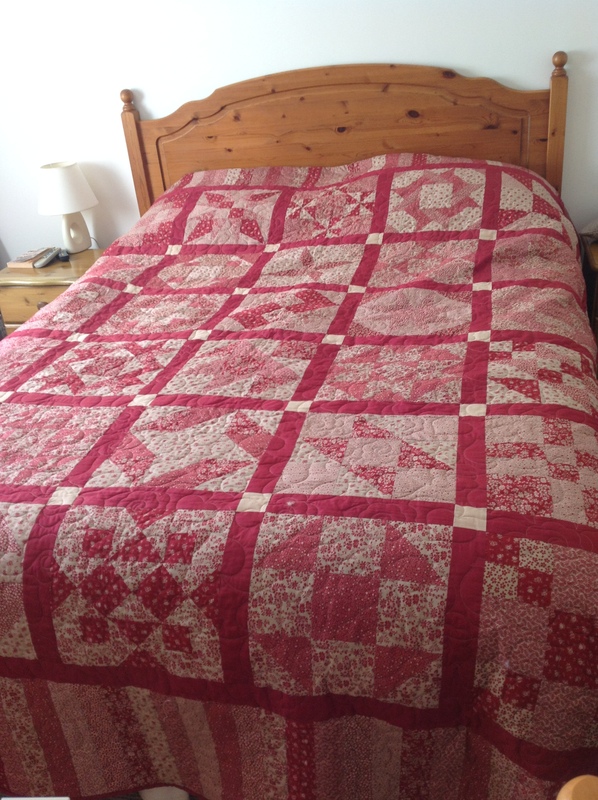 I have named it my ‘Two Colour Nine Patch Quilt’. I have worked on this quilt for a couple of years or more, doing a few blocks at a time. 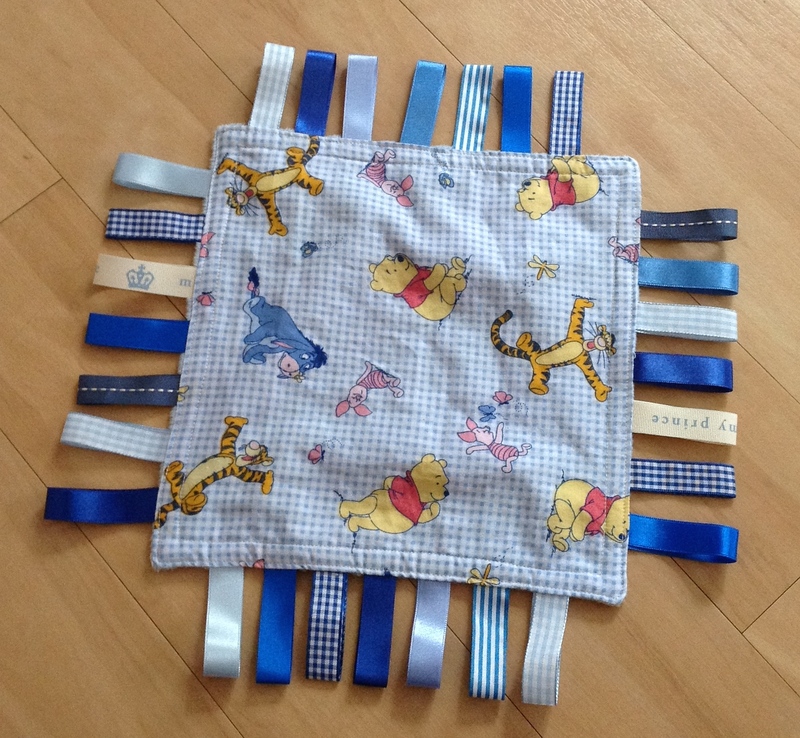 There are thirty different nine patch blocks in it, finished with a piano key border. It took hours of time and much hard work, but was very rewarding when finally finished. I hope you like it! 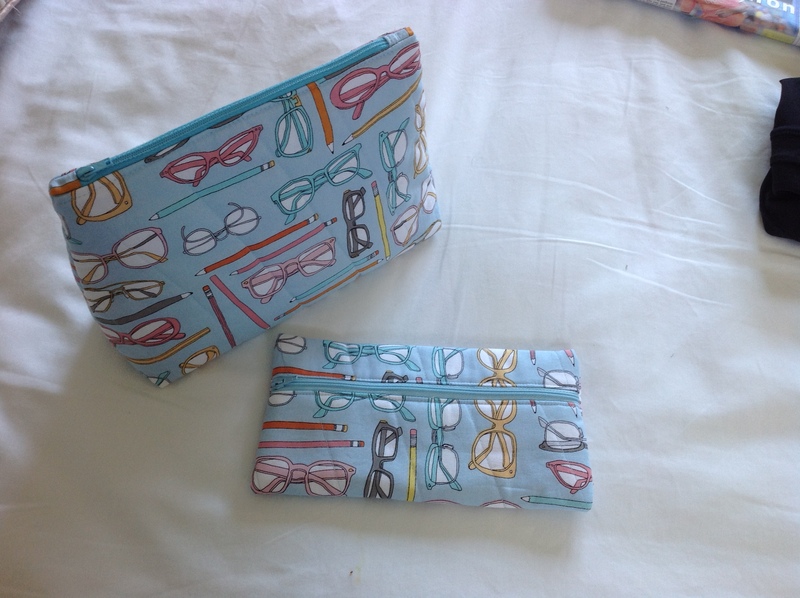 Amongst many other things I have also sewn these purses for my daughter’s birthday; they are great to hide other presents in. 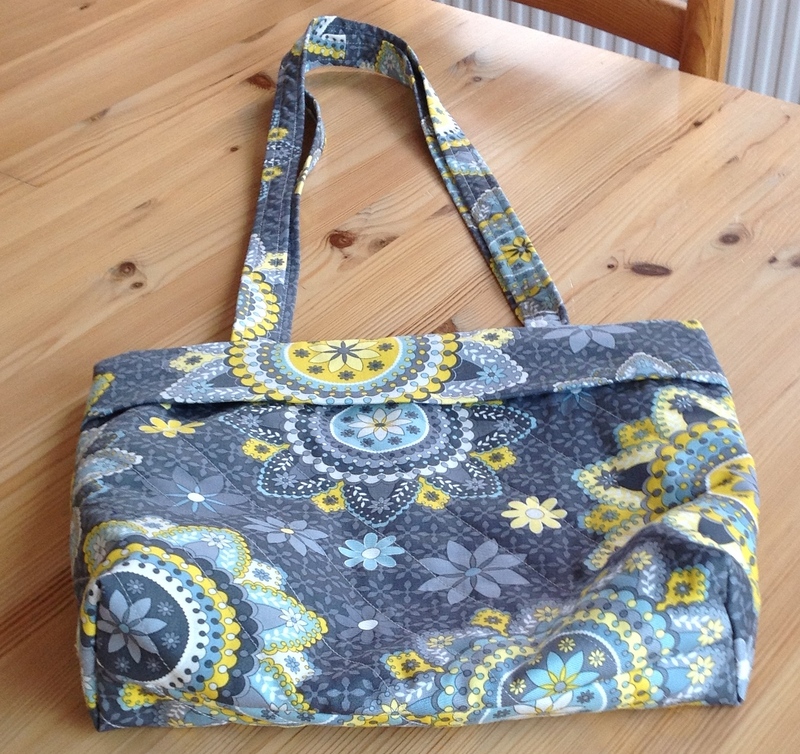 I love making purses and am teaching how to sew them at the Patchwork and Quilting Pals group next month. 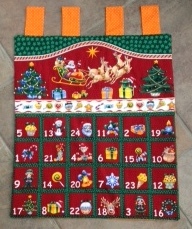 Advent calendars have been made for my two gorgeous grandsons. I spent time beading the pictures at the top for Farris. Here are the beaded Christmas trees. 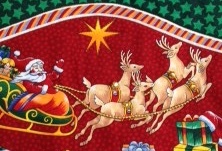 Of course I couldn’t leave out Santa’s sleigh! It was fun adding the bells. 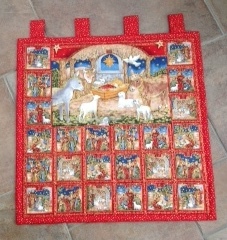 Joseph’s advent calendar has the beautiful traditional Christmas story pictures on it. I have finished it off with two star buttons at the top. There is lots of gold on this calendar, so it didn’t lend itself to beading. Both advent calendars are waiting their poles to hang them from. The workshop has started them, but is rather slow this year! 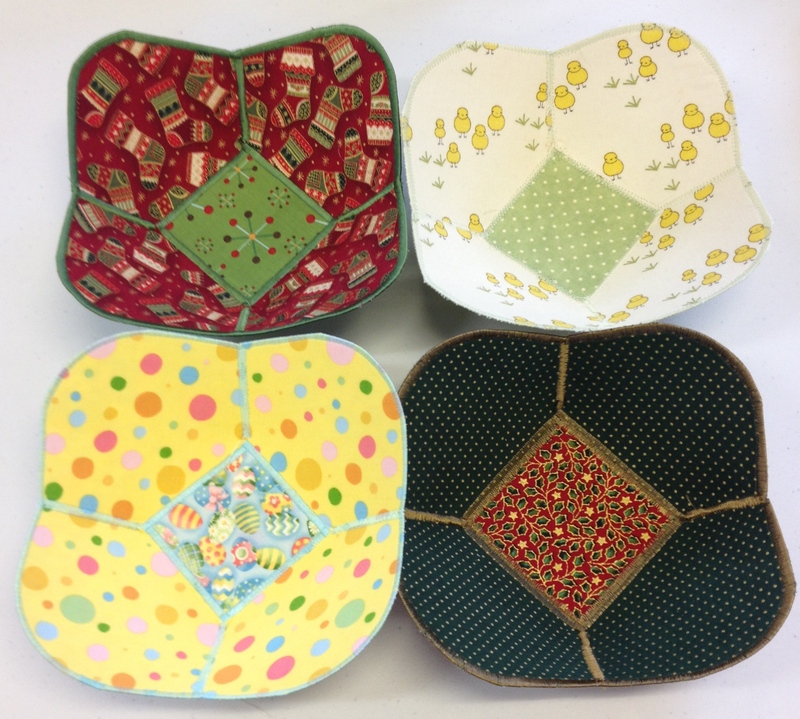 Bags, Bowls and a Cushion! It’s been a while since I blogged as I’ve been very busy enjoying life to the full. I’ve been sewing, but can’t show my work as they’re gifts and the recipients haven’t seen them yet. 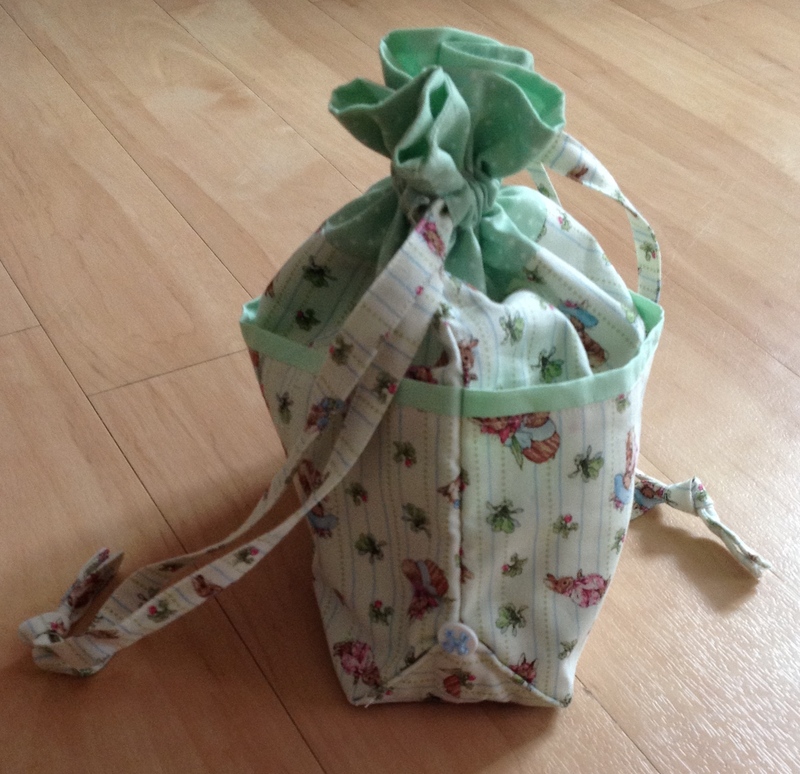 All of my Patchwork and Quilting Pals have been very busy making bags. Some of us are using them to carry equipment to club, others have made them as gifts for friends or expected grandchildren. 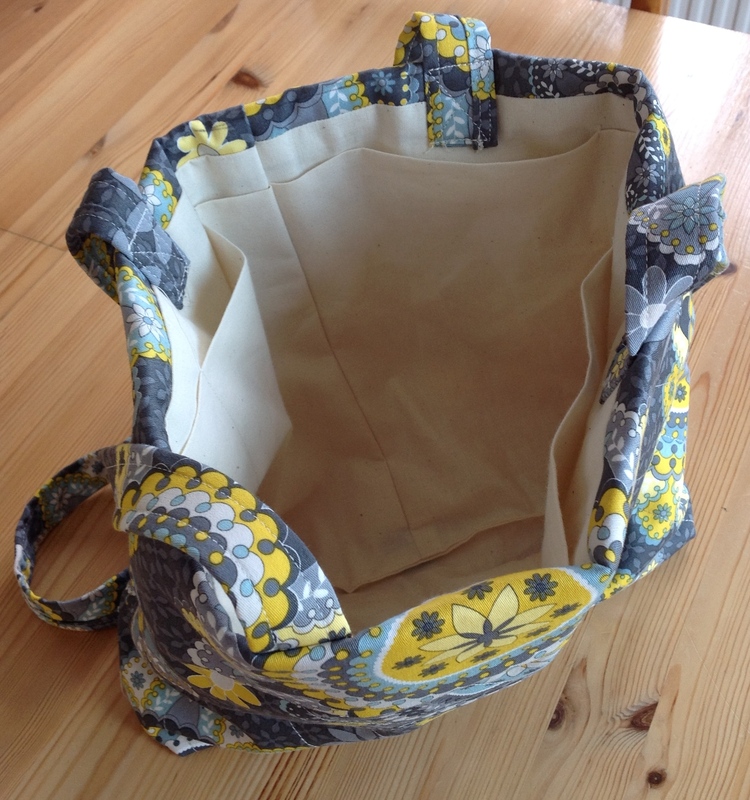 These bags are designed with lots of pockets on the outside and a large open interior. Angela showed us how to make them and we have all found them very useful. As I tend to tip things up in the car I used Velcro to secure one long pocket, so I could keep my rulers protected in one place. I added a zip to the other pocket, which means my clover mini iron will also be safe. 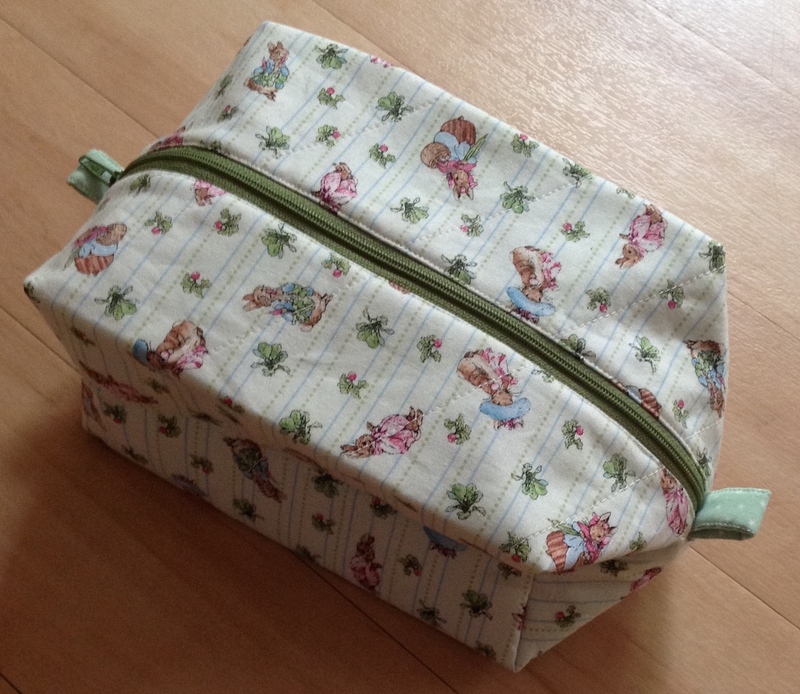 Then I decided I needed to attach extra pockets on the inside as I cart along lots of paraphernalia and wanted to try to become a bit more organised. It has made clearing up easier, as everything has its own place and I can see what is missing. Look at the inside of our Easter and Christmas bowls. 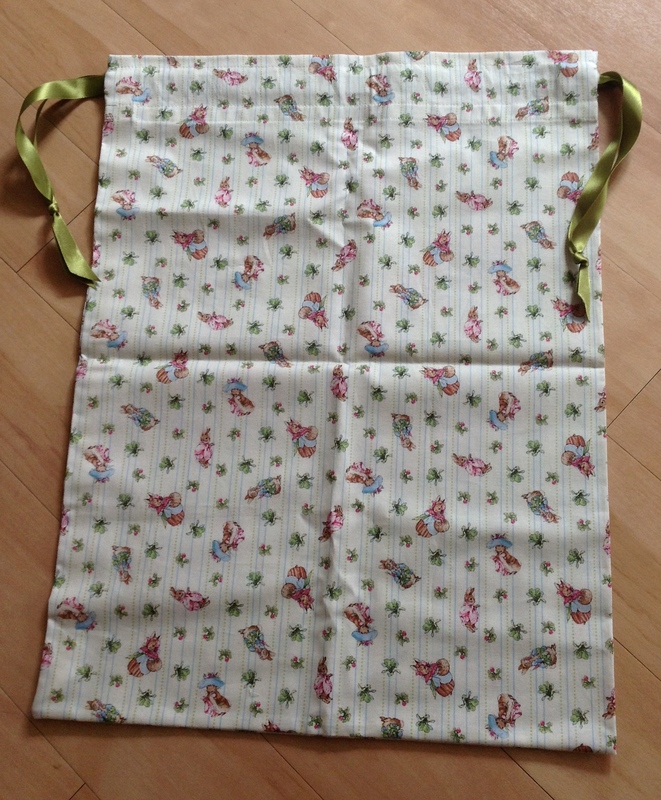 They are all reversible so can be turned inside out revealing the reverse fabric. A while ago I was shopping with Farris when he spotted this ‘nee-nor’ fabric as he calls it. It was on top of a bolt of his digger fabric and he kept saying “Digger Granny, nee-nor Granny”. 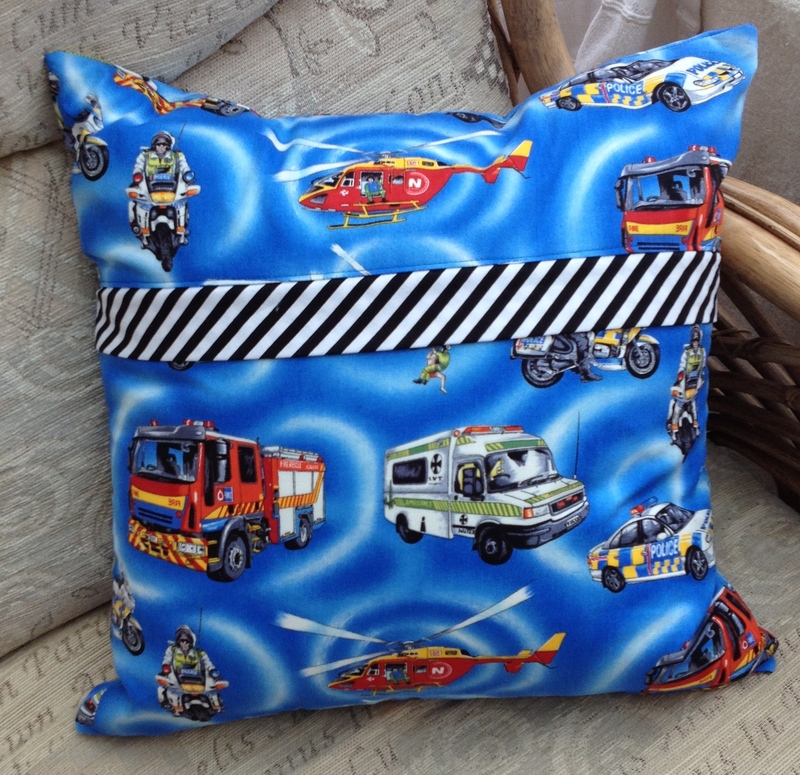 Well I couldn’t resist and made him a cushion for his second birthday. How time flies! I covered the back zip with a flap made out of black and white fabric. 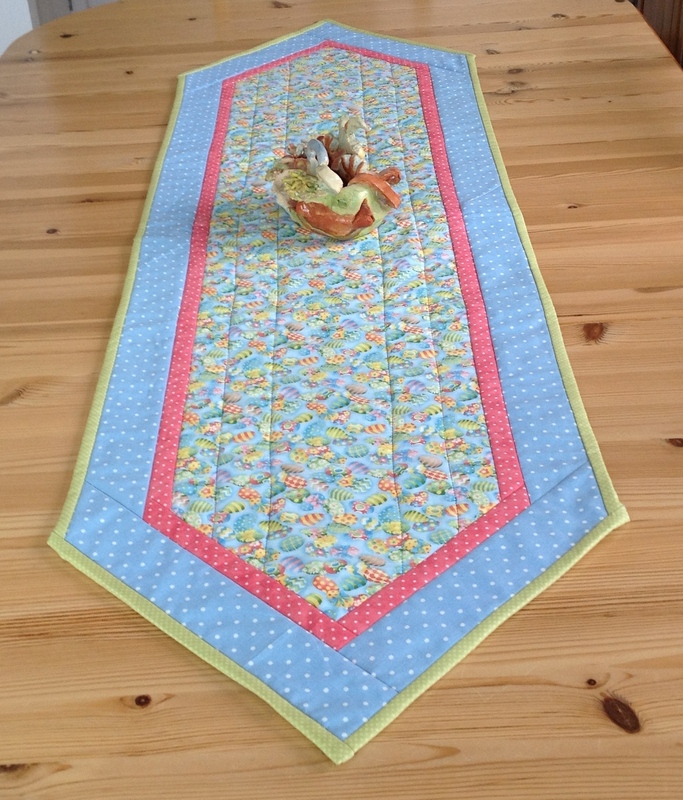 Its the same fabric I used on his cot quilt. 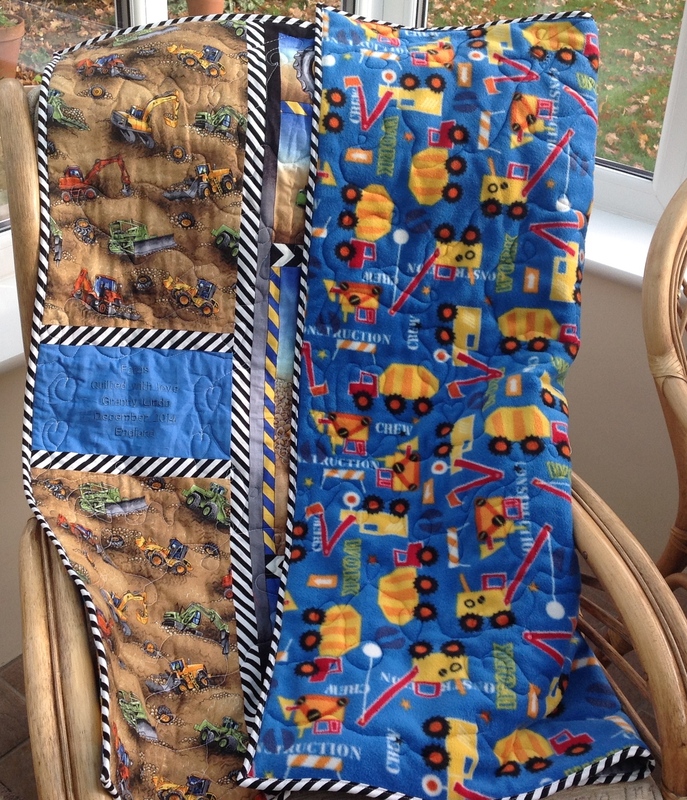 I am pleased I managed to finish the next two quilts for my beloved grandsons before Christmas. Farris is delighted with his ‘digger’ quilt and sleeps with it crunched up beside him. I backed it with a soft fleece, which is very soft and cuddly and also covered in ‘diggers’. I free-motion quilted this in loops, which was a bit of an experiment, as I’d never used this type of quilting on fleece before. It was quite thick as I’d also added an inner layer of polyester wadding. 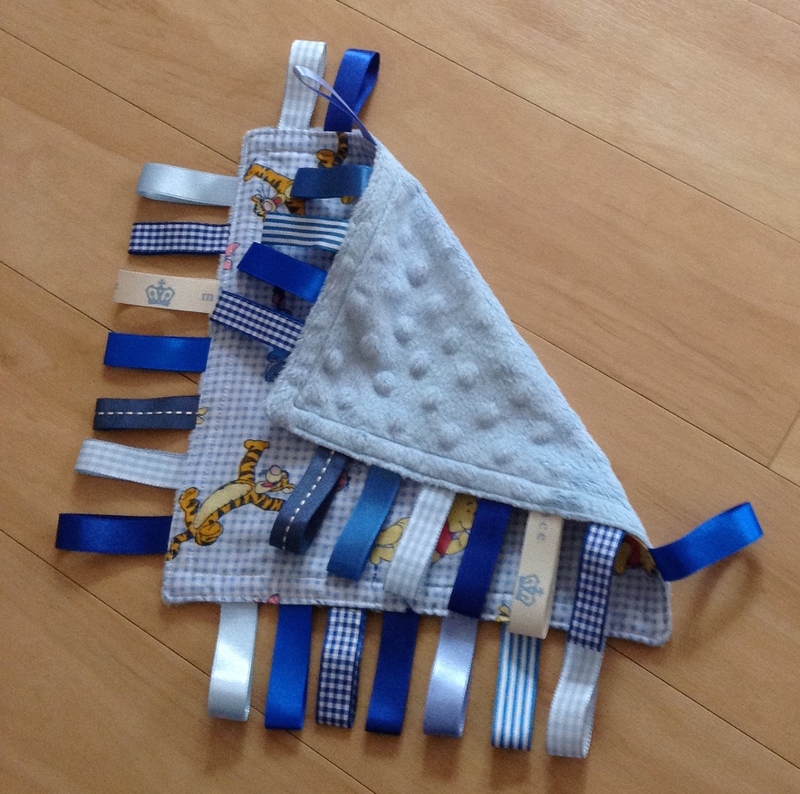 I used Isacord thread, which flowed through the machine needle like a dream. No thread breakages or knots beneath my work! 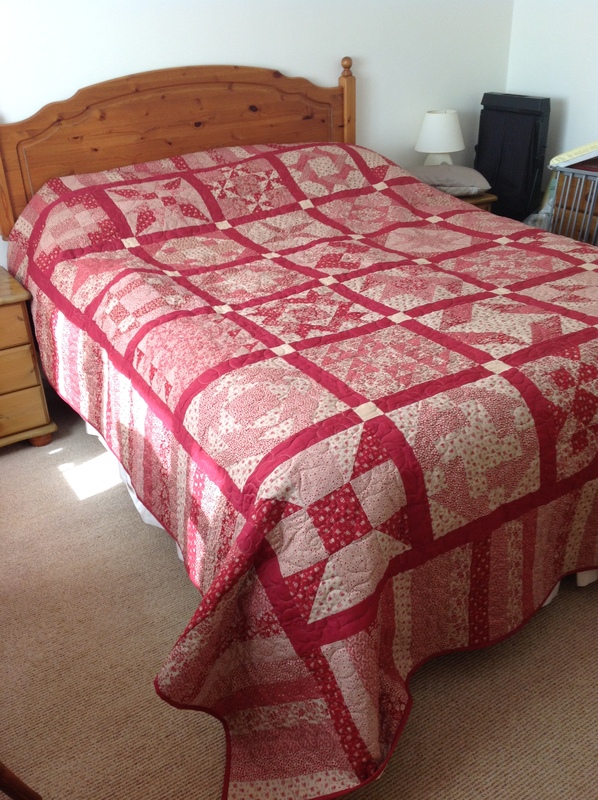 The central feature of the quilt is a panel, to which I added matching fabrics. I decided to label it on the front, as I didn’t want anything other than soft fleece on the back. The quilt is cot bed size and was fun to make, especially as I knew he would love it. On Joseph’s cot quilt I framed the animal fabric with a narrow blue band and then a soft green and white spot. His parents found the animal print in Spain. 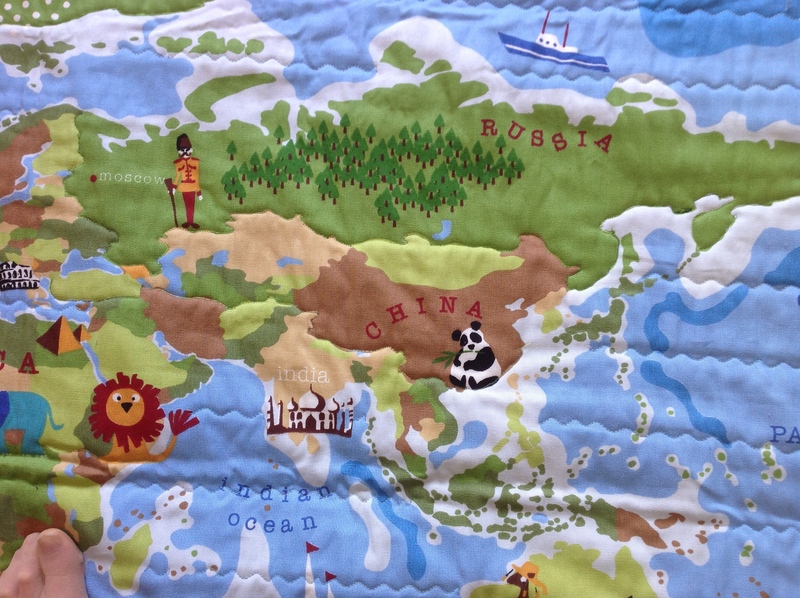 It’s absolutely perfect for the nursery, and can be sewn with the pattern in either direction. I’ve photographed it with both the brown teddies and pink deer upright, but you can turn the quilt up the other way, so the red elephants and green hippos are all standing tall. I’ve wadded this quilt with a polyester wadding as I’m disappointed with the wool wadding I used on the last baby quilt I made. Wool wadding might be sold as lighter and natural for babies, but it loses its loft in washing; leaving the quilt looking decidedly sorry for itself! Let’s hope the polyester wadding stands up better to normal washing. My new year resolution is to finish my king size quilt that I started well over a year ago and my Christmas lap quilt that I started work on, but got waylaid by the baby quilts. I think I’m going to back both with fleece for extra warmth. I’ve just cut out all the fabric pieces for the January craft bag-making day at PQPals. I think I’m going to add extra inside pockets measured to fit my bits and bobs, so that when my bag is finished hopefully it will be easier to keep track of my equipment at classes. Well I wish you all a happy 2015, where have all the years since the millennium gone? 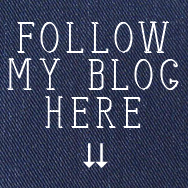 Its been a long time since I blogged, as I’ve being busy finishing off things that were long overdue. Yesterday the Patchwork and Quilting Pals met and I demonstrated how to cut out and sew a dresden plate block. Those who wanted to join in decided that they wanted to make mats rather than more cushions or table runners. As the shops are now selling Christmas fabrics most of us decided to go along with ‘Christmas in July’ and made them with a festive theme. Look how different they all are! At least now I’ll have one new thing to put out this Christmas, finished… before I start on the ‘baby’ theme again! Enjoy the fine weather and have fun! I have had soooo many enquiries about quilting and sewing that I decided to start another sewing group this coming Monday. 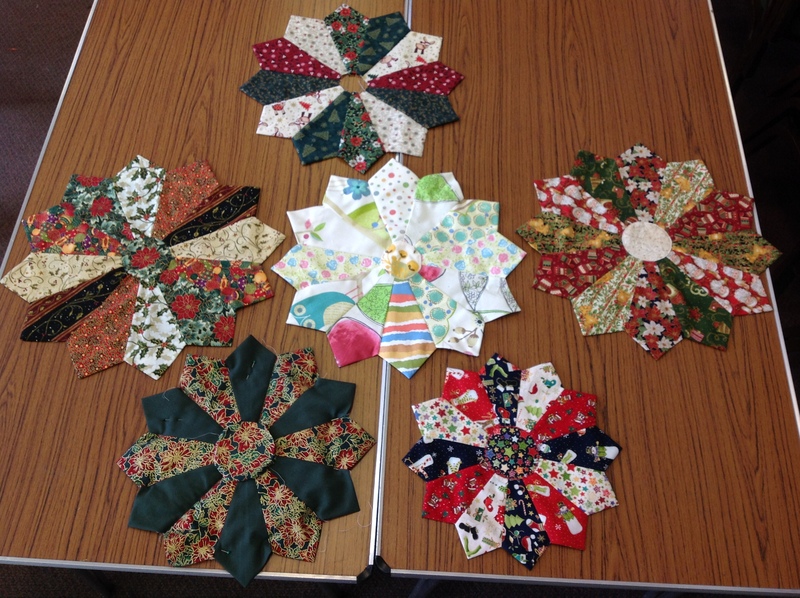 We are going to be called Patchwork and Quilting Pals and look like we are nearly full at our first meeting! WOW, sewing is popular now. 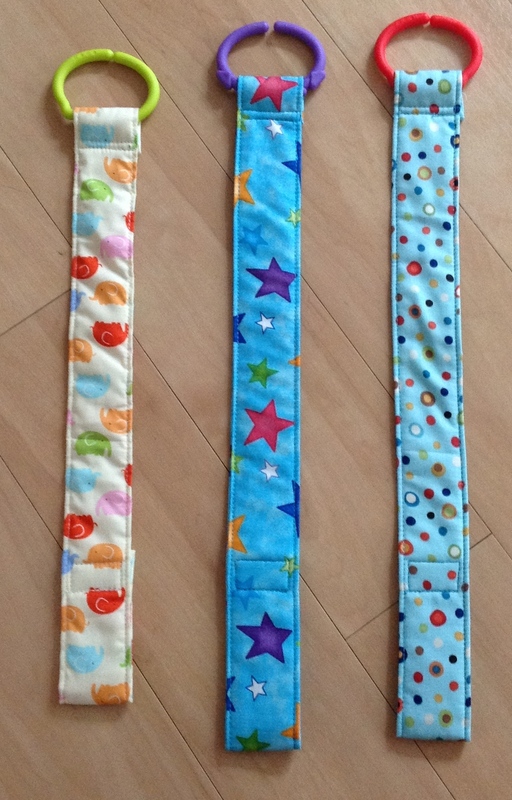 I am kept so busy that I often only get time to sew on my dedicated club days and my ‘to sew list‘ is ever increasing! I did manage to finish one potential quilt top by turning it into hanging pockets so I can store all my rulers safely. I’ve been working on it for over three years, so was glad to see something useful made with it. No photos at present as it needs securing to the wall properly. 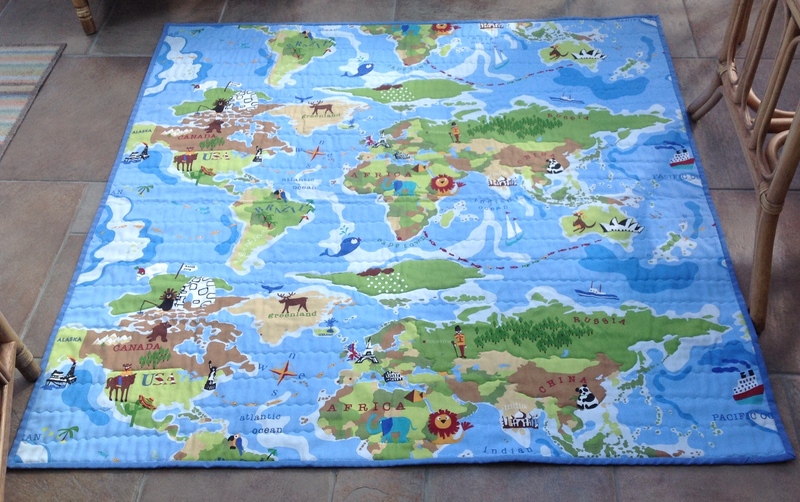 My next project is to quilt the playmat for Farris, something that has been on the list for months. I hope to get it started at least before he is a year old at the end of the month. I wonder where the year has gone and adore spending time with him.